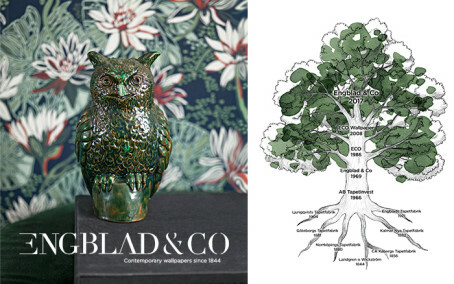 Engblad & Co launches Modern Spaces. A sophisticated wallpaper collection which embraces modern architecture and focuses on style conscious homes. This exclusive collection displays a strict minimalism while also giving rooms a soft, refined feel. Modern Spaces gives structure and harmony to every moment of life. ENGBLAD & CO LAUNCHES DANCING CRANE "SPECIAL EDITION"
Engblad & Co will launch the iconic and long-awaited pattern Dancing Crane, designed by Emma von Brömssen, in new colour settings. 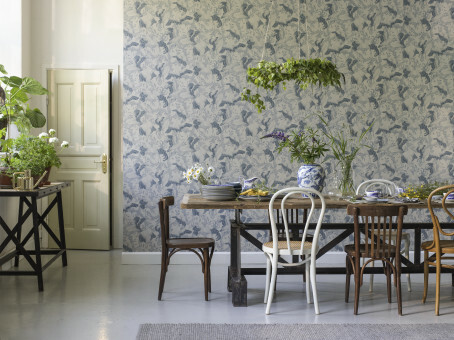 The Dancing Crane Special Edition consists of three new wallpapers with a sophisticated and elegant aesthetic which creates a stylish and balanced whole in the home. The Special Edition will be launched at the end of January. Graphic World is a modern graphic wallpaper collection designed by Engblad & Co. Consisting of simple, striking shapes combined with elegant, Scandinavian minimalism; the collection suits a variety of rooms and interior styles. Global Living is an expressive wallpaper collection featuring finely balanced colourways and patterning sourced from around the globe. The designers at Studio Engblad, were inspired by the cultures and traditions that have shaped us down through the millennia. This wealth of designs embodies our heritage and our roots, but also spells our future. In late May, Studio Engblad launches a new Limited Edition color of the Miramar pattern in Ocean Blue. The Miramar pattern is part of the Lounge Luxe collection, launched as late as January. Miramar is one of the most loved patterns in the collection, and it was obvious for Studio Engblad to create a new exclusive color. ​Sweden’s largest design award, ELLE Decoration Design Awards, was launched yesterday and many winners were corroded in the presence of the industry and prominent guests. The award “Wallpaper of the year 2018” was awarded to Engblad & Co collection Atmospheres which is a design collaboration with Ilse Crawford. 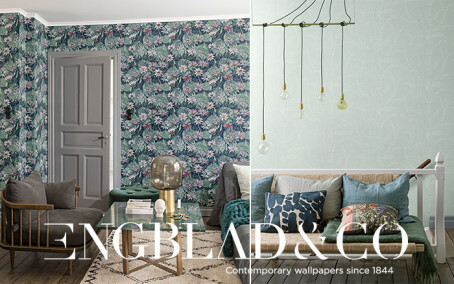 Swedish wallpaper brand Engblad & Co announces the release of its latest collection, Lounge Luxe. Inspired by some of the world’s most iconic hotels, the collection’s 12 prints are characterised by indulgent, exclusive luxury and a passion for visual storytelling – they also allow for the creation of that fantastic ‘getaway’ feeling in the home environment. The latest collection from Engblad & Co is the result of a collaboration with British designer and founder of Studioilse, Ilse Crawford. 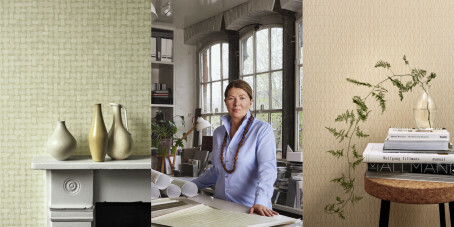 Known for her humanistic approach to design, Ilse’s collection for Engblad & Co is a series of wallpapers that express the human touch and form a warm background for contemporary life. As a tribute to its remarkable wallpaper heritage of modern and stylish patterns which has been a trademark for over 170 years, Engblad & Co is introducing a collection of historic prints from its one-of-a-kind archive. One of the most in uential wallpaper brands of Scandinavia is changing name to pay tribute to its heritage and design statement re ecting modern interior design of today. Mist-clad mountains that soar in the living room, light green leaves that spring up behind the bed, and soft geometric wood surfaces that line the walls with a natural stillness. “We live high-paced lives, which makes it nice to come home to an environment where we can enjoy some peace and quiet and recharge our batteries in the same way that we would out in nature,” says Noomi Spange, Designer. ​Taking time to enjoy times gone by can provide inspiration and generate exciting, new ideas. 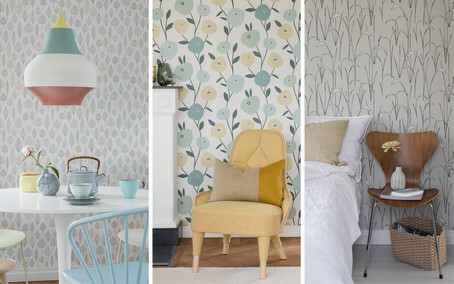 This was how the Reflections wallpaper collection was born - and it will be launched at the end of September. “Reflections features a new, modern take on motifs that hark back to the 1950s, 60s and 70s,” explains Madeleine Sidemo, designer in charge of the collection. 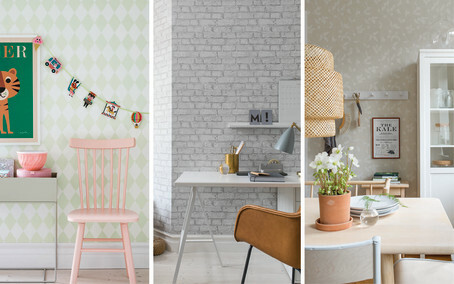 ​Eco Wallpaper is now releasing its extensive Decorama EasyUp collection, which has been jointly developed with housing companies, decorating contractors and specialist retailers. “The collection features bright, warm colours with elements of shimmering mother-of-pearl and more muted shades. 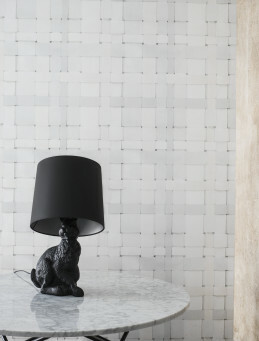 The selection of 60 designs includes something to suit every room,” says Noomi Spange, Eco Wallpaper. Sand, wood, stone, paper and clay are some of the natural surfaces and structures to be found in the Beyond Colour wallpaper collection. 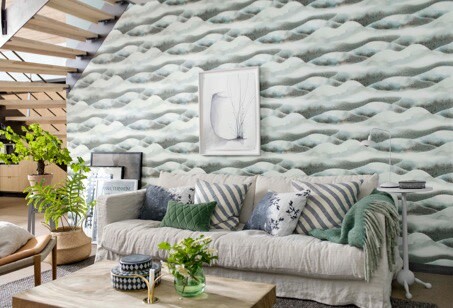 “Incorporating natural tones into the home is a trend that is enduring, and with wallpaper you don’t just get the colours but also the structure and materials that create a deeper, cosier feel,” explains Madeleine Sidemo, Head of Design for Eco Wallpaper. With Crayon, the new collection from Eco wallpaper, what you get is actually more than first glances might suggest. From a distance, your eyes tell you it is pure, warm and natural but most definitely single-colour. Come closer, however, and you may be surprised to see that it reveals much more. The latest collection from Eco Wallpaper features patterns created by the Spanish designer Jaime Hayon, one of the world’s most celebrated creatives right now. 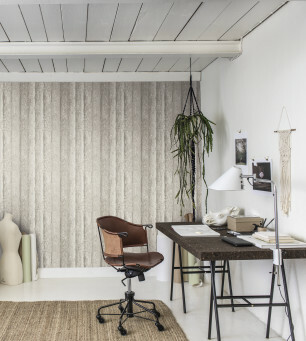 In this joint venture with Eco Wallpaper he puts his design on wallpapers for the very first time and the result is a series of patterns that the user can play a part in creating. 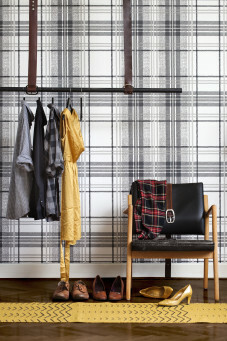 The latest wallpaper collection from Eco Wallpaper features patterns created by the Scandinavian design group Front. This is the first time that the pioneering trio puts their design on paper creating a wallpaper collection based on a series of different shadow techniques. INSPIRED BY ANCIENT HANDICRAFTS AND THE PATIENT PHILOSOPHY OF THOSE WHO PRACTICED THEM. CREATED FOR THOSE SEEKING MORE MEANING AND RELAXATION IN EVERYDAY LIFE. 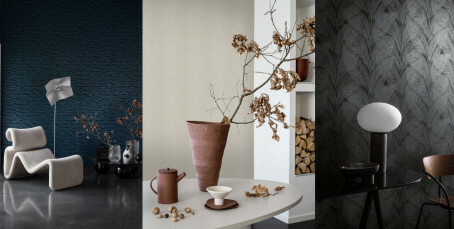 ECO SIMPLICITY IS A NEW WALLPAPER COLLECTION WHOSE SECRET LIES IN A BEAUTIFUL MARRIAGE OF CONTRASTING WORLDS. 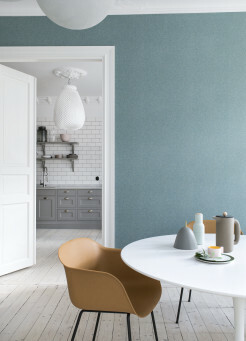 ​Eco Soft Surface is a new wallpaper collection inspired by the sensory stimulating world of textiles. Taking design cues from fashion classics, Eco Wallpaper have created nine prints that are gentle on the senses and leave warmth in the heart.